The Yaesu FT-60R dual-band 2 meter/440 MHz HT boasts 5 watts output on both bands. It also features wideband receive from 108-520 and 700-999.990 MHz (less cellular). An Emergency Automatic ID system will automatically cause your FT-60R to transmit your callsign and engage the mic if you are disabled and unable to press the PTT switch. Two programmable keys are provided for your convenience. There is even a password feature to prevent unauthorized use of your radio. Radio to radio cloning is possible with the optional CT-27A cable. Other refinements include: One touch NOAA weather, nine DTMF auto dialer memories, die-cast weather resistant case, ARTS Auto-range transponder system. There is also a Mono-band and Memory-only operating mode. better than ± 5 p.p.m. Alpha-tags. CTCSS & DCS. WIRES II. ARTS. Emergency Automatic ID (EAI). I've only had this radio for a few months. I bought it because it used the same battery and accessories as the VX-170. 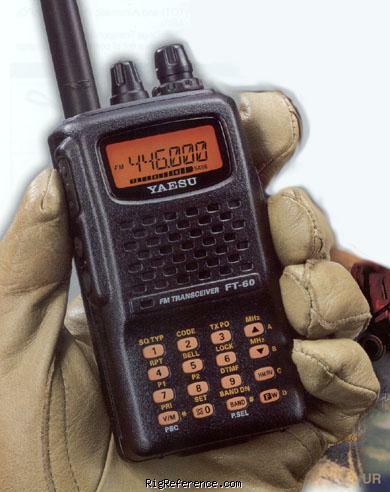 I needed a 70cm handheld for my role supporting backup inauguration communications and was about to buy the VX-177 when I found this radio for not much more. It worked well for that event. I often find myself hitting the 0 key, which enables some sort of DTMF transmit function that really drives me crazy. I don't like it as much as the VX-170, but it does have a knob for the squelch. Love mine. Very compact, direct entry keyboard and use my on a daily activity. Estimating the value of a rig can be challenging. We collect prices paid by real hams over the years to help you estimate the current value of the Yaesu FT-60R. Just bought or sold this model? Let us know what you traded it for and help other ham operators!